Armstrong Steel recently completed the construction of an Armstrong Steel Buildings pre-engineered metal building system for a client in Riverton, Wyoming to house his new equipment. DENVER –Armstrong Steel recently completed the construction of an Armstrong Steel Buildings pre-engineered metal building system for a client in Riverton, Wyoming to house his new equipment. Erection of the new state of the art seven thousand five hundred square foot facility began June 20th 2011 and was completed June 28th 2011. When owner/operator Brandon Romer decided to expand, he put his trust in Armstrong Steel Buildings to take care of all the details. He opted for pre-engineered metal buildings construction because the time he would save from start to finish. Pre-engineered metal buildings often go up in less than half the time of conventional construction. “Armstrong Steel was by far the best steel company to deal with. There was no high pressure sales, no nagging phone call. I just told them what I was looking for and they got back to me within 24 hours with a very competitively priced package. Everything was very straight forward and simple, from the ordering to the shipping and on thru the completion of the project. Nick, my construction coordinator, and the rest of the guys at Armstrong made this project go smoother than I could have ever imagined!” exclaims Mr. Romer. Romer says he solicited construction bids from at least three other local contractors and couldn’t even come close to beating the prices offered by Armstrong Steel’s Construction Services Division. “Mr. Romer was a pleasure to work with. His project is a prime example of the considerable savings and superior craftsmanship provided by all of us here at Armstrong. 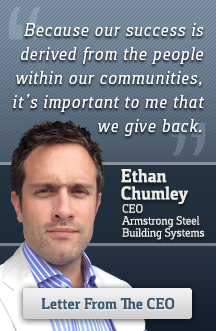 He insisted on the highest quality pre-engineered metal building solution on the market and said that’s why he selected Armstrong Steel,” says Ethan Chumley, President of Armstrong Steel. Mr. Romer’s next door neighbor was so impressed with the quality of the structure and speed at which Armstrong’s crews completed construction, that he contacted Armstrong Steel himself shortly after Mr. Romer’s building was completed. If you or someone you know needs space, contact America's most trusted name, Armstrong Steel, today.